Approximate U-value of 2.2 W/M²K. Our Heritage Windows have been designed with the future in mind. All of our aluminium window and door systems have long since been upgraded to a superior polyamide thermally break barrier as opposed to the old resin thermal break barrier. This old resin system is being phased out, but is still in use by some window suppliers. 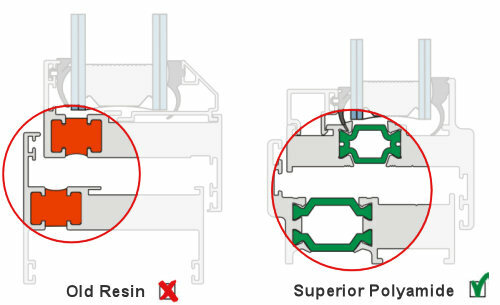 Polyamide gives at least a 30% improvement to all thermal efficiency and Uw figures on a typical window (1480 x 1230mm) when compared to the old redundant resin break.